NCT just forwarded me an email about an event happening in LA during the middle of May. 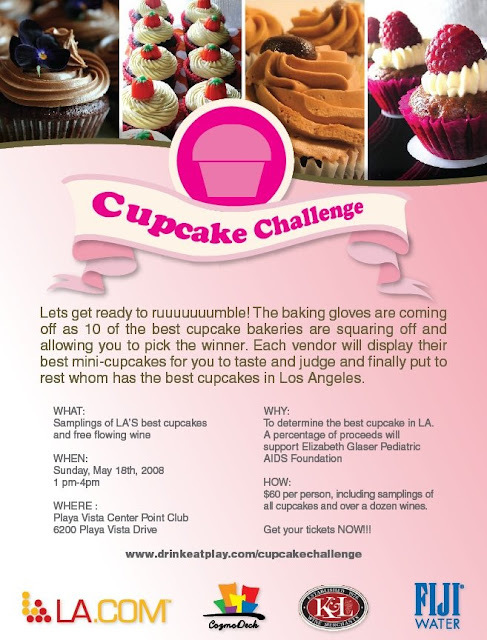 Its the Cupcake Challenge! You can check out more info on details and tickets here. I feel a little iffy about the price. Yes I've spent more on food but I wouldn't be drinking any wine and it is still just cupcakes... and they are mini! If anyone finds what percentage is going to the foundation please let me know. I'd feel more comfortable going if I knew a major portion were going to such a wonderful cause instead of getting pocketed. SWEET. Guess this'll be a good excuse to make some more food incursions up north. Why can't I ever satisfy my sweet tooth? If you know any more places for good sweets liz, drop me a line! Around SD I can think of Elizabethan Desserts, Extraordinary Desserts, Champagne Bakery. Mmm... you can do a search for desserts on my site to find a few other places out of town and recipes. This seems like a weird combination. Wine and cupcakes? Dessert wine with cupcakes or wine with savory cupcakes? Guys it was alot better than I thought it would be too...Tons of girls running around sampling tastey treats! But you could choose wine or sweets...My fav had to be the first one i tried.. some stawberry baby cakes creation from god aka Leynas Kitchen. gosh....i needed one watching the playoffs. Who would have thought that you'd be sick of cupcakes. Thank god for the fruity ones that gave us breaks between the sugar. My overall vote went to the strawberry ones as well. Yea.. I think so too. Great we got someone to head up there to try it. Now I wish I wasn't so harsh and gave it a try. I think I'm gonna have to stop by these bakeries now when I'm in LA.